Elaine Adair Pieces: Seeing RED! My stash of RED scraps is getting out of control. (Yeah, what's new about that!). This Judy Martin quilt, Country Cousins, has been tugging at me for YEARS! 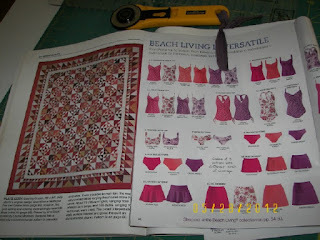 Then a few days ago, I received this Land's End catalog of all these red and purple and pink and orangey bathing suits. I'm not purchasing bathing suits but this ad was the catalyst to start somthing RED. I kept it simple, decided against, Judy Martin's design, and started Buckeye Beauty or Jewel Box. Bonnie Hunter also has a similar design. What fun! Making this one is fairly FAST! Here are 56 blocks - for now, I'm aiming for 110. The block is 6 in. finished. I need a total of 240 4-Patches, and 240 HSTs. I'm halfway there! 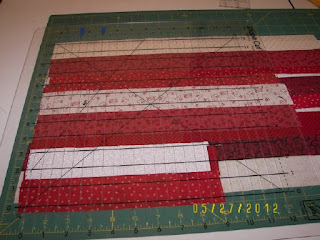 Here are my strips of red and light, pressed and laid out on my cutting mat. I still have issues with cutting accurately, with eyestrain and accuracy, so I purchased a June Tailor Shape Cut ruler. It has slots at every 1 inch and half inch. This works VERY well for me. Each cut strip remains precisely the same size, and I'm not straining my eyes. I've showed the ruler before - it's one of my favorite tools. It's a bit flimsy, so I store it on it's side between furniture cabinets, along with big square rulers. This was under $30.00 at JoAnns and I used my 40% coupon. I've VERY happy with this gadget. An entire mat full of carefully laid out strips can be cut in just a minute or two. Press down firmly on the ruler and nothing moves. One must be careful to cut at the right slots - it's easy to get carried away and miss your mark! I used my Olfa cutter - not all cutters work. Here it is with the ruler laying on top of the strips, ready to cut! You slip your cutter into the slots along the edge of the ruler. This would be PERFECT for a variety of blocks, especially when you have hundreds of cuts to make. I haven't tried it on anything but strips yet. Love my Shape Cut ruler thingie... certainly saves a bunch o' time and eye strain! Good idea to use the advertisement for inspiration. !!!! Elaine, I love this quilt...officially love, love, love! The reds in your quilt are rich and gorgeous, and I've always had a soft spot for this traditional pattern. Nice combo! 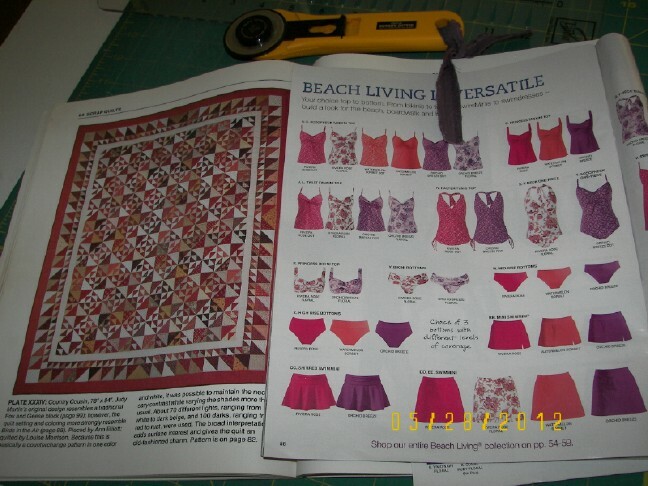 My shape-cut ruler is one of my favorite quilty gadgets. 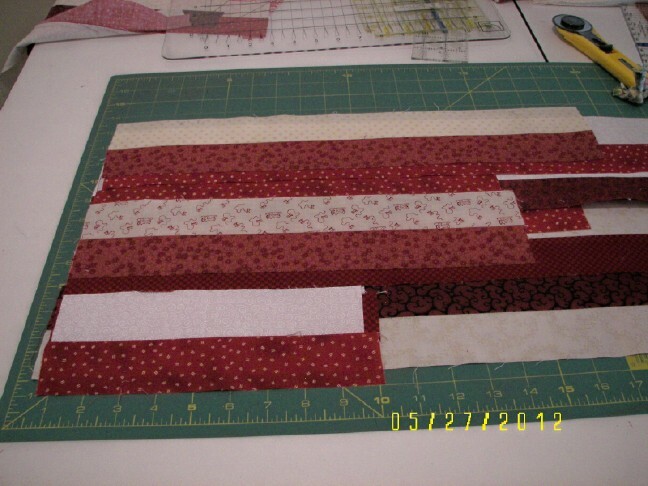 Makes such short work of cutting quilts with lots of strips. I love my shape cutter too. Here's a tip I use for mine when I'm cutting a lot of the same size strips. Use a small piece of blue painters tape to mark the slots you'll be using. I can zip through the cutting in no time. And the tape can just be moved the next time I want to cut a different size. I love this new red pattern you've started. You're such an inspiration! Beautiful blocks! I agree with my friend Linda. After cutting in the wrong slot of my shape cutter a few too many times, I started using the blue tape system also. It helps! Ages ago, I had a class with Judith. She came to our quilt guild. And, the cutter -I used one of those for cutting paper, too. Love the thing. Your red quilt is rich and beautiful. I'm looking forward to seeing how you do the borders. Thanks for the explanation of the shape cutter ruler. I need something like this so will be watching for it to go on sale or maybe get a coupon. Your reds are simply deeeelish! Love it. That's coming along quite nicely, those colors really do go well together! Wow! You are fast! 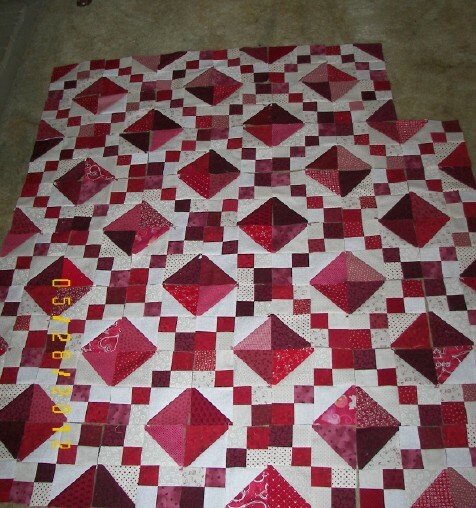 This red quilt is going together for you like a fire engine. I love the look of it. I am loving it. I have too many blues. I will put this on my list to do. wonderful idea. Your RED quilt looks like fun. I have one of those rulers. It is great! Love, love, love the reds! Don't you love how something so ordinary, like that ad, can spark a quilt idea? And you're off and running! It looks great! Not the same as the Judy Martin quilt, but it has a similar feel to it. I've heard good things about this special ruler - I may have to check it out! Thanks for the tip. Love the Jewel Box block--I'm just finishing up a quilt made in jewel toned blocks. That cutter sounds terrific, and a lot cheaper than a die cutter! this quilt is looking fabulous. I LOVE red. I keep using up the red fabrics I buy. I've got the shape cutter too. I forget to use it sometimes but it does make quick work of cutting lots of strips.